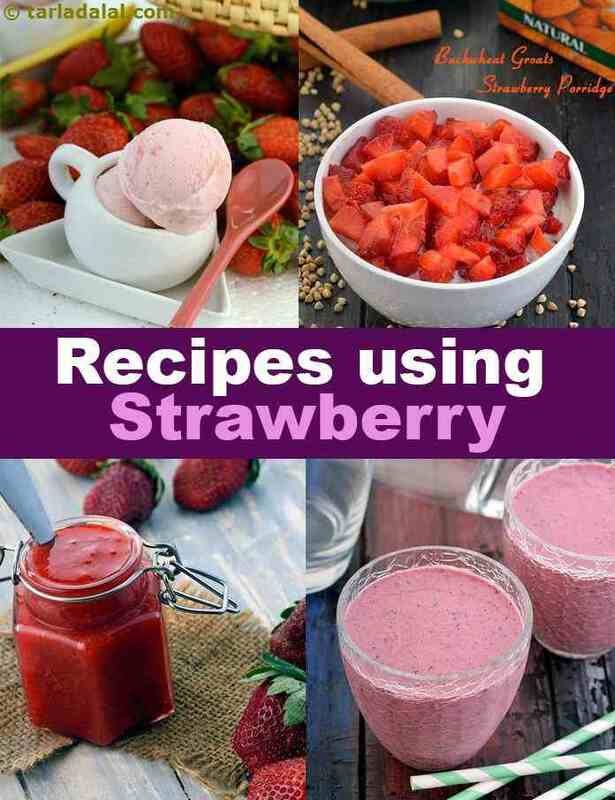 Strawberry recipes | 382 strawberry recipes. Nothing can match the goodness, taste or freshness of season’s fruits and vegetables. While most seasonal fruits like mangoes and strawberries are now found all around the year, there is a different joy in ripe and juicy in-season fruits. Strawberries are the most popular form of berries that are in season from November end till February. They are red in color and have an irresistible aroma. Whether you toss them in a salad or cook them in sugar to make a jam or simply whip up a strawberry milkshake, they blend together very well with other flavors. Strawberries are chock-full of phytonutrients. They are a rich source of potassium and magnesium, antioxidants, vitamin C, dietary fiber and iodine. While buying strawberries, ensure the berries are firm, plump and free of mould. They should have a shiny, deep red color with the green cap-like stem still attached to it. Give the ever popular Indian dessert a fruity transformation with the addition of strawberries. Try your hands on this recipe of Strawberry Kheer and surprise your friends and family. Forget buying expensive cream cheese and substitute with a paneer-whipped cream layer to make delectable treats like Strawberry Paneer Pie. Strawberries in Custard Sauce is surely worth a try when you can lay your hands on this juicy fruit this season. The soft texture of the custard contrasts with the mouth-feel of ripe berries. A quick-fix to your sweet tooth cravings, the Strawberry Praline Cake requires not more than 5 ingredients. A visit to Mahabaleshwar (a hill station in Maharashtra, India) would be considered incomplete without relishing the famous Strawberry Cream. A treat in a glass, this combo of whipped cream and strawberry, is sure to be loved by all, for its succulent berry flavor and melt-in-the-mouth creaminess. Strawberry rocket salad with a combination of sweet strawberries and bittersweet rocket (arugula) leaves is a flavorful, light salad. Also, the Strawberry Spinach Salad in a tangy dressing creates perfect harmony in this simple salad. Roasted sesame and poppy seeds and crunchy blanched almond slivers add a rich crunch to the salad. Fruit and Lettuce Salad is not only a visual delight but also, bountiful of nutrients like vitamin A and C, which act as antioxidants. The off-beat combination of exotic fruits in Avocado Grapefruit and Strawberry Salad is my another favorite. Strawberries make a bright and flavourful addition to fruit salads. Orange, Spinach and Feta Salad with a tongue-tickling dressing is surely a surprise for the palette in each bite. The best way to incorporate strawberries in your diet is by making Strawberry Yoghurt or Strawberry and Black Grape Raita, an innovative twist to the plain humble yoghurt! Relish them as it is or serve as an accompaniment to your meal. Desserts for breakfast? Hell yes! Most people enjoy pancakes and waffles for breakfast. How about upgrading them? The Nutella and Strawberry Mini Pancakes with its wonderful flavor and texture is sure to delight you. Health conscious people can savor bowls of unique dishes like Strawberry Steel Cut Oats with Tea Masala or Strawberry Oats Pudding and enjoy a satiating breakfast. Looking for a quick and easy dessert? This no-bake Strawberry Soufflé with chopped strawberries and crush tossed in whipped cream will become your go-to dessert this season. Juicy strawberry sauce topped on a crumbly tart and baked to perfection, the Strawberry Cheese Tarts is another delightful dessert. The Strawberry Hearts is a freshly baked sponge cake sandwiched with strawberries between the layers and topped with frosting and sliced berries. You can perk this up with the addition of pineapple and praline to make a Strawberry and Pineapple Praline Cake. The combination of chocolate and strawberry is a match made in heaven. Be it something as simple as Chocolate Coated Strawberries or an elaboration preparation like Brownie and Strawberry Surprise, Quick Strawberry and Chocolate Sundae, Layered Strawberry Sundae. This delicious crunchy, fruity and creamy Sundae will be enjoyed by both old and young. If not Sundae, you can dig into basic desserts like Strawberry Banana Apple Sorbet or the Fresh Strawberry ice-cream. Hope you enjoyed our collection of 382 strawberry recipes, from Strawberry Sauce, Strawberry Jam to Strawberry Jelly Pie and Strawberry Cream Roll. Strawberries are sharper in flavour than other fruits, so use a mild fruit like apple to tone it down. Milk provides calcium and strawberries supplement it with vitamin c which is extremely essential to strengthen your baby's immunity. You can also use bananas instead of apples. Easy to make and even easier to eat - that's creamy mouth-watering vanilla mousse.